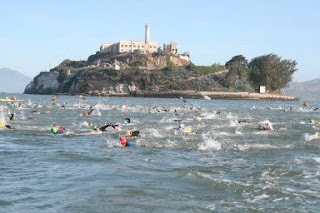 Escape From Alcatraz Race Report! So there might have been others things I wanted to talk about or mention about this past week but none of that really matters because Escape From Alcatraz was just too much fun! Coming into the event, I knew my goal was to not push it hard because I have a tough training weekend coming up at Clearlake where I'll be doing 3/4 distance of an Ironman! 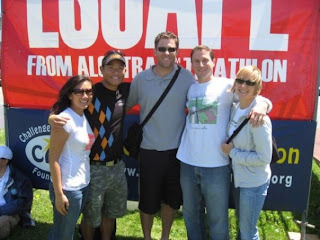 It all began on Saturday when I met up with some friends at the athletes meeting where they brief you on the course and the swim conditions. Saturday night, Mary and I stayed over at our friend Eric's place because he was conveniently located 1.5 blocks away from the start and transition. Sunday morning, Mary and I woke up and strolled with our bikes and gear in tow to transition. I found my number and began setting up my transition! Note to beginners- do not take up a lot of transition space because your stuff will be moved! Which is what happened to my neighbor. She set her stuff up right next to mine..and then had her transition bag on the other side of her wheel..big no no was space is tight in transition and we still had to fit someone else between her and I. That someone else came and for her to set up...some stuff had to be shifted so we shifted! 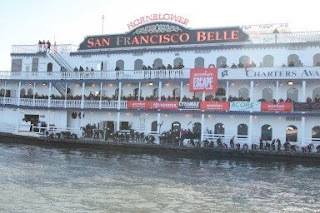 Mary and I boarded the shuttle bus at around 5:30am or so to head to Pier 3 where the San Francisco Belle awaited us! We boarded the boat which set sail at 7:15am for the 8am start! Weather conditions couldn't have been better- warm, sunny and minimal wind! Atmosphere on the boat was just fun! 1,800 of us.. body gliding.. putting our wetsuits on..taking pictures..or if you were like my friend Mike..napped! As it got closer to 8am..I pulled Mary hand and started for doors. 8am came..the horn blew and the Pros were off..the doors opened and we were next! Mary and I darted for the door and all you see are people jumping off..the volunteers are yelling at you to "Go! Go! Go!" If you didn't go..you'd get pushed! I held my goggles and jumped in with no hestitation and started swimming! People were going left...people were going right..it was pretty darn chaotic! The water was warm for SF Bay standards..57 degress but it was a lot choppier than I had expected. At one point, I could have sworn that I got some air being thrown around by the swells! Not a time to freak up though..I just put my head down and kept swimming! I was told at the athlete's meeting to keep the Sutro Tower at my 2pm. I tried to do that the entire time but I still over shot my swim and ended up at Crissy Field..swimming probably 20 minutes more than I had to! At one point during the swim, a kayaker told me to make a sharp left but with the current coming left, I told him that it wasn't going to happen. As I looked toward shore, I saw people running along the beach from Crissy Field to the St Francis Yacht Club (target swim finish) so that's what I decided to do..swim to Crissy Field! I was so excited to feel the water temperature dip as that means I am close to shore! As I exited the water..running towards the timing mat..I heard my sister and friends cheering! My friends Heidi and company even started a rhyme as they wondered where I was.. "Yi..Yi..where could she be?" 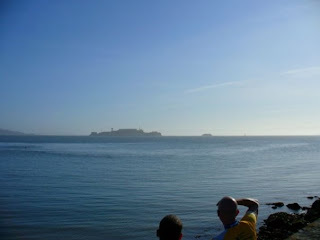 Picture below- just finishing the swim thinking,"I really swum to Crissy Field!" Later I found out..along with 300+ others that overshot the finish! The swim should have taken me no more than 40 minutes ended up taking me about 57 minutes- oppsy! I arrived at my bag that had my running shoes..pulled off my wetsuit..put on the shoes and ran the mile to T1! And now the bike! I had a pretty good ride on the bike..1 hour and 17 minutes for the 18 mile hilly ride. I do that ride often so I knew every corner, every turn and every climb! I felt bad for the 1st timers or anyone new to hills! Saw M2 on the bike course as well as Coach Bobbie, Emma Louise and Kara out cheering. The run..I was just glad to be on foot because that meant I was almost done! The 8 mile run, while a little hilly, is beautiful! Takes you along the coastline to Baker Beach.. up the 400 step sand ladder and back. The most comedic moment was when I passed this guy who was yelling at myself, "I'm such a f*cken nut..why am I here?" repeat..haha. As I passed him, I said, "Buddy..you're here to have fun! You're almost done!" I hope he calmed down after that but it was just funny to come across. Kara ran with my for a few minutes after the sand ladder before veering off to her car. Not long after, I saw Emma-Louise who ran a few miles with me. Finished the run in about 1 hour and 30 minutes. I can't complain since I had to put my calves in a contrast (55 degree water for 10 min followed by hot tub water for 10 and repeat) bath two days prior and was able to run without any calve pain! All in all, a very fun day out! 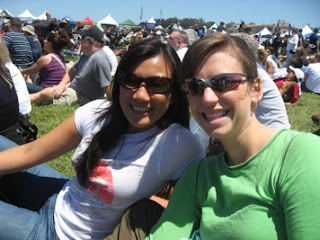 After the race, I found out from Emma-Louise that over 300 people overshot the swim finish and ended up at Crissy Field. Some said they've never seen anything like it! Usually it's just one or two! I definitely want to do the race again next year if I should be do lucky to get in! I have a swim do over to do! Thanks to family and friends who came out to support! It was so great to see them all there! More pictures next week!! Sounds like one hell of a race! Congratulations!! You go girl! !